Portable Fire Extinguishers. Compact, lightweight and extremely powerful. We often tend to ignore some very important things in life. Like daily exercise, a visit to the doctor, dental checkups and a fire extinguisher. Gone are the days when fire extinguishers were ignored red cylinders fixed on the wall in one corner of the room. Looking at the number of accidents that happens due to sudden fires, keeping a fire extinguisher handy has become mandatory. Fire extinguishers are as bulky as they are important and need extra space. Instead of making space for it separately what if you get a fire extinguisher sleek enough to fit into your drawer or the front cabinet of your car? An Extinguish Stick is exactly what I am talking about. Its state of the art design makes it not only technologically advanced but also stylish and portable. 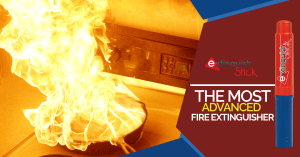 Imagine the hassle of trying to accommodate the traditional extinguisher in your car or kitchen where it does not interfere with the interiors as opposed to just slip the new Extinguish Stick into one of the cabinets. 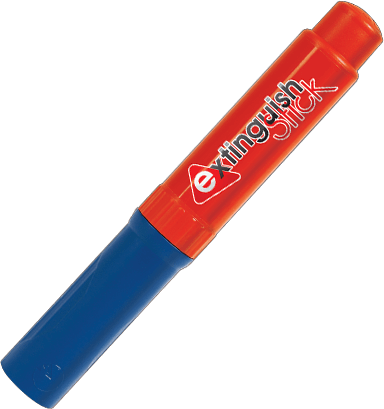 Extinguish stick resembles a simple road flare in appearance and is equally easy to use. It has a red colored cap covering the entire ensemble and a blue colored handle at the bottom. In the hour of need user just needs to remove the cap off Extinguish Stick and fix it at the bottom of its blue handle. There is a yellow tag on the top of the stick. Extinguish Stick gets activated the moment this tag is removed. Before removing the tag extinguish stick should be moved towards the affected area. A simple chemical reaction is triggered the moment yellow tag is removed from the mouth of Extinguish Stick. Once the stick is triggered a jet of visible gas is emitted with pressure strong enough to suppress the flames. The duration of this emission is 50 seconds or 100 seconds depending on the device deployed, which is more as compared to emission duration of traditional extinguishers. Potassium Nitrate used in Extinguish Stick combines with oxygen in seconds which leads to unavailability of oxygen to support combustion; this makes the procedure of suppressing fire seamlessly fast and easy. The gas emitted as a result of the chemical reaction in Extinguish stick is an aerosol and hence there is no residue left on the surface it is used on. It is advised that the area in flames should be sprayed with gas continuously till fire is completely suppressed to avoid re-ignition. 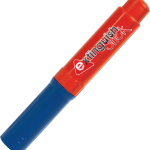 Extinguish stick is for one time use only, and once deployed will discharge continuously for the set time. Once the threat has been nullified, Extinguish Stick can be taken outdoors to spend itself or the end of the stick can be just submerged in a tub of water and later discarded like any other trash. It is not required to be discarded separately as it is Eco-friendly. Most Extinguishers use chemical like Mono ammonium Phosphate which is corrosive in nature. It settles on the television, computers and other electronic equipment and slowly starts corroding them. The process may not be visible for months before you finally see the impact of corrosion. 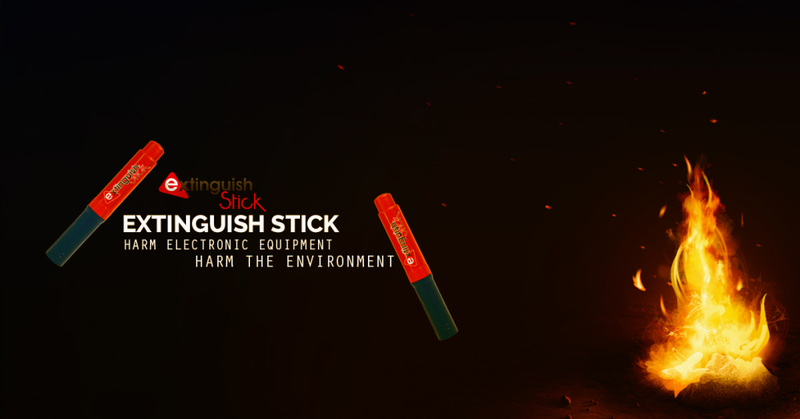 Extinguish stick does not use these chemicals and hence you don’t have to worry about your electronics while using it. As opposed to the traditional bulky fire extinguishers Extinguish Stick does not need any maintenance. It is a onetime use product which can be easily discarded after use. Besides this because of its portable and light design extinguish stick can be used even with one hand. Irrespective of a person’s physical limitation Extinguish stick’s extremely simplified user mechanism and instant activation makes it user friendly. Often we fumble and get disoriented during panicky situations, making it difficult to think in the right direction. In such panic situation this product can be used as easily as using a pen. Overall, we are looking at a cutting edge technology packed in a light and portable design which is extremely easy to carry, can be used on any kind of surface without thinking about the damages caused by residues, does not need any maintenance and can be easily discarded as it is 100% eco-friendly. Apart from this it has the capability to suppress all types of fire that is A, B, C & E Rated Fire Suppression. The product exceeds expectations completely. Extinguish Stick can also be used as a smoke flare type device to signal for help during an outdoor emergency. Are you thinking how much you will have to pay to have one these in your kitchen or your car? Well it is surprising that with all these remarkable qualities Extinguish Stick is available at a price as small as its design. Price of an Extinguish Stick is less then third of a traditional extinguisher. It is a portable and affordable life saver which everyone must have.